Let’s get one thing straight right from the start: You cannot have your next plane printed for you. Not now, not soon, probably not ever. It’s a beautiful dream, to be sure, like the Willy Wonka invention that let kids reach into a television screen and pull out a chocolate bar. In this case, you’d work up some CAD drawings, maybe spin an on-screen model around to check your work, then hit command-P, head over to the printer, and taxi out in your new ride. Print me up a couple extra copies, while you’re at it. Sciaky 110 EBAM System. Image courtesy of Sciaky. As I said, not going to happen. Still, there’s a good chance your future aircraft will have plenty of 3D-printed parts, thanks to huge advances in what the engineers refer to as additive manufacturing. 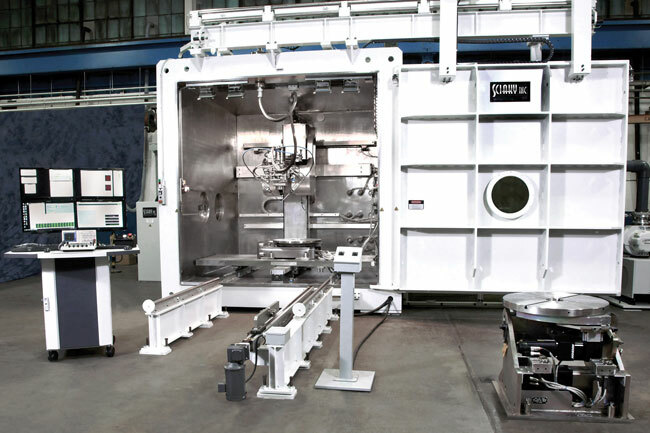 The technology enables huge weight savings, more complex parts shapes, sometimes faster production, revolutionary parts count reductions, and an unprecedented level of fine control over material strength and flexibility. 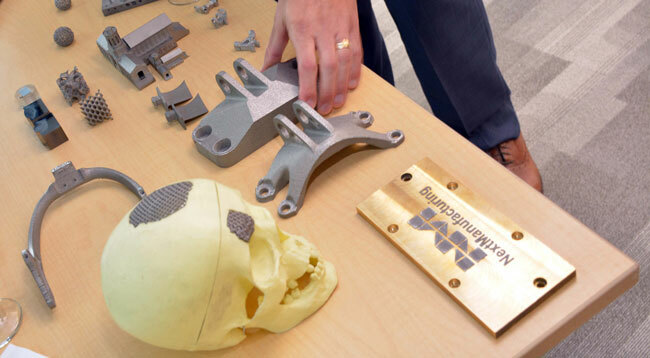 Here’s how additive manufacturing works. In traditional metal manufacturing, parts are either cast from metal that’s poured into a mold, whittled down with machining tools from a solid block of material or forged into shape with a hammer. By any of those methods, there’s a lot of expense and wasted material and time. Additive manufacturing works in reverse, by adding material slowly, layer by layer. In the most popular, powder-bed machines, a thin layer of metal powder is spread across a flat surface. Then, in much the same way that an inkjet printer head squirts its ink patterns, a laser or electron beam passes overhead, melting selected areas of powder into solid metal. That’s one layer, as fine as one-fifth the width of a human hair. Spread some more powder over the cooled result and make another pass. Repeat again and again and again—and again!—until you have a finished structure. It’s not a new idea. 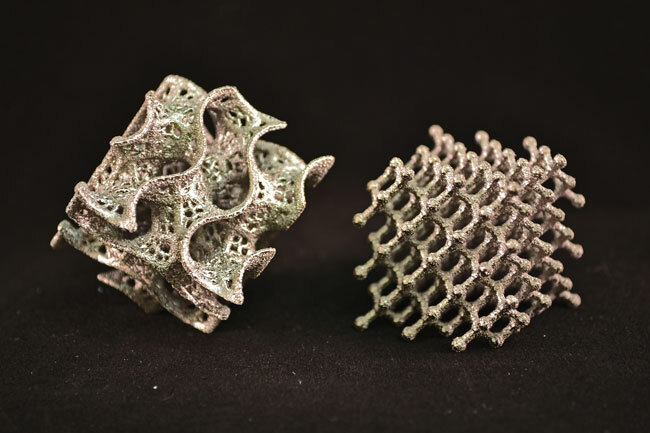 3D printing experiments go back 20 years or more, according to Jack Beuth, a metals additive manufacturing pioneer who’s professor of mechanical engineering and director of the NextManufacturing Center at Carnegie Mellon University. What has made the technology take off, so to speak, for aerospace has been the development of computer-driven lasers and electron beams. Those result in faster builds and the potential for finer control. It also turns out aviation and aerospace make the perfect case study as additive moves from the lab to the factory. 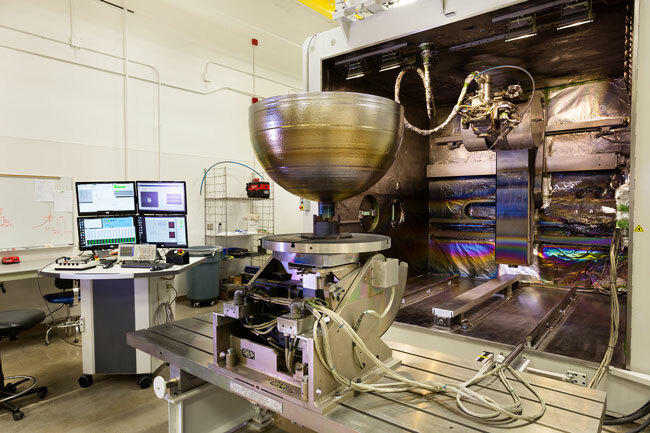 Take the cobalt chrome fuel nozzle that GE Aviation has just begun to 3D print for its Leading Edge Aviation Propulsion (LEAP) jet engines. LEAP engines have become the company’s best-selling powerplant ever, with more than 10,000 on order even though the first customer unit is yet to be delivered. 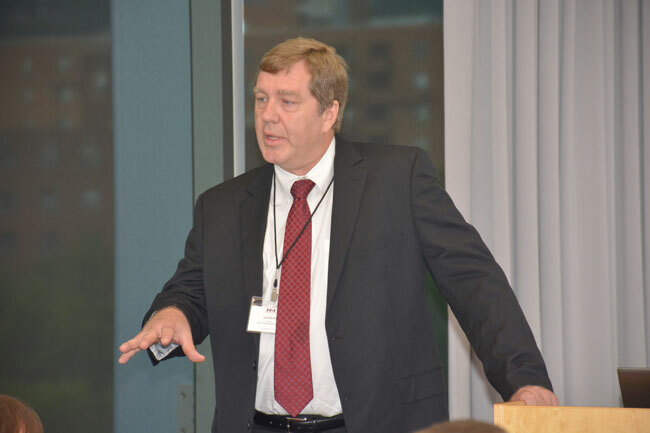 Dr. Jack Beuth, Director of the NextManufacturing Center at Carnegie Mellon University. Image courtesy of CMU Engineering. But the real game changer was efficiency. As designers sought to optimize fuel flow, there were nozzle shapes they dreamed up that simply couldn’t be made with traditional methods. With additive manufacturing, even the most convoluted geometry became possible. “There was a significant performance advantage,” Beuth says. The additive LEAP nozzle is a significantly more durable part, too. Because it’s made of a designer alloy never before used in aviation, the new nozzle is estimated to have five times the life of the component it replaces. Oh, and it’s lighter and stronger. Each of the 19 new LEAP nozzles in an engine weighs 25 percent less than the previous component. Plus, the absence of welding seams means eliminating those places where part failures most often occur. 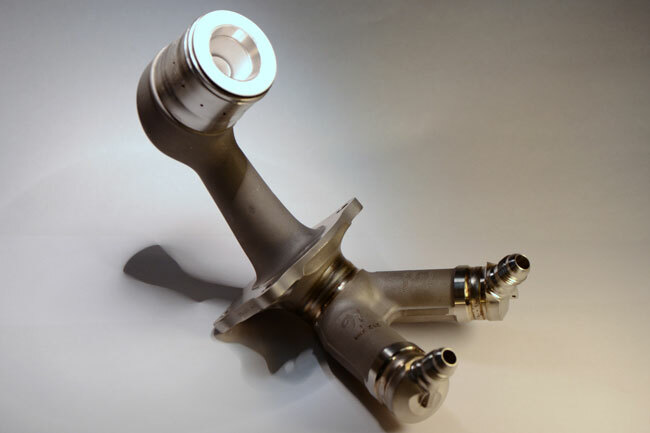 GE Aviation’s 3D printed chrome fuel nozzle for its LEAP jet engine. Image courtesy of GE. Nice win all around, but how does this help if your next aircraft purchase isn’t a single-aisle jetliner? Glad you asked, because the experience GE gained with its LEAP initiative has led directly to an all-new GE Advanced Turboprop (ATP) engine, which will power the forthcoming Cessna Denali. For the ATP, which competes with the venerable Pratt & Whitney PT6 series, about 35 percent of all the engine parts will come from printers instead of castings. That’s 855 parts made the old way that have been reduced to, um, 12. And that’s a big deal. GE says the ATP will make 10 percent better power and burn 20 percent less fuel than Brand P.
Now, GE is going all in on additive: The ATP turboprop will be made in the Czech Republic, but GE recently opened a factory in Auburn, Alabama, to capitalize on 3D printing. The company expects to print 45,000 nozzles there per year, with 100,000 by 2020. Still, there are limits to powder-bed laser manufacturing. 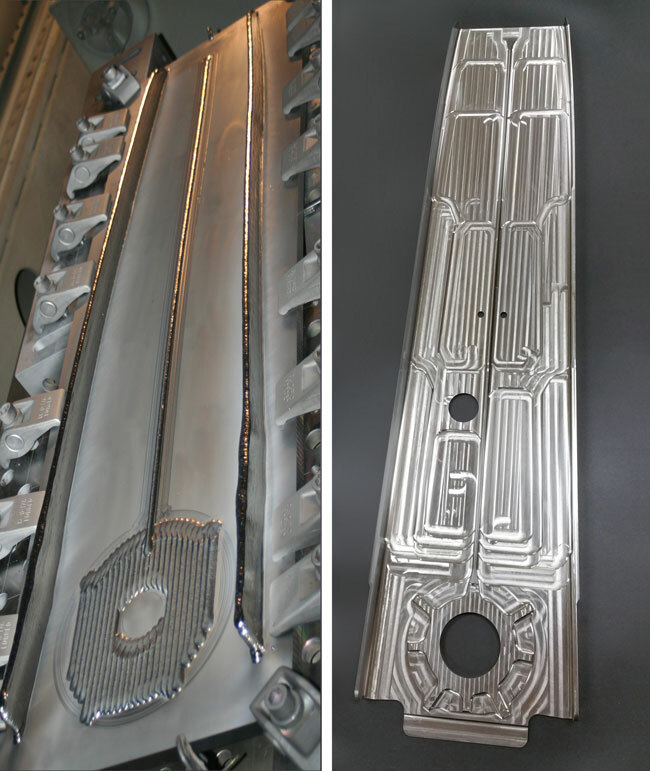 “You don’t want to take months to make a part that’s 100 pounds at a gram an hour,” says John O’Hara, Global Sales Manager at Chicago-based Sciaky, Inc.
“If you can make it with a powder bed, you probably ought to,” O’Hara says. “But if you’re talking about anything bigger than about a football, it just doesn’t make economic or technical sense. Enter the Sciaky Electron Beam welding machine. It’s a room-sized box that transforms spools of metal welding wire into parts at rates of up to about 20 pounds per hour. Sciaky has used its equipment to make flaperons for F-35 fighter jets and is currently working with Airbus on large, titanium structures for its airliners. Sciaky’s Electron Beam welding machine—seen here constructing a titanium propellant tank—transforms spools of metal welding wire into parts at rates of up to 20 pounds per hour. Image courtesy of Sciaky. In aerospace manufacturing, that waste is called the buy-to-fly ratio, and it’s a primary driver of expense. It also would take about 18 months to make a forging, according to O’Hara. “If you give me an order for one of those, as long as I have the wire in inventory, I can print one for you by Friday,” with less material and less finish machining required. Those titanium parts will last longer and have fewer maintenance issues, even while they enable new levels of performance. And the benefits won’t just be for production parts. Prototyping will be faster and cheaper. Even components for which casting still makes sense can be cheaper, since tooling and dies can be 3D printed. The Airbus rear upper spar—preform (left) and finished (right)—could take months to manufacture using traditional methods. With 3D printing, it can be done in days or weeks. Image courtesy of Sciaky. Yet, as impressive as these results are, Prof. Beuth says we’re just beginning to see the benefits of 3D printing. At Carnegie Mellon’s NextManufacturing Center, researchers are experimenting with techniques to control the properties of metal at the molecular level. Alter the size of the crystal grains in a metal, and it turns out you can change strength or flexibility. The Carnegie Mellon team's honeycomb designs are largely impossible without 3D printing. Image courtesy of CMU Engineering. It’s a compelling vision for the future. And, this future is coming at us at increasing speed. In 2014, Carnegie Mellon bought state-of-the-art 400-watt powder bed laser manufacturing machines for its labs. Since then, laser power has increased by an entire order of magnitude, with the latest generation machines fusing together the energy of four 1 kilowatt lasers. “That increases your build rate by a factor of 10 compared to our machine, which was the very most advanced one just two years ago,” says Beuth. Suddenly, parts that didn’t make sense to additively manufacture just two years ago, have a business case. Beuth says that in the last year, he’s seeing a whole new level of interest in 3D printing. In the past, most inquiries came from aerospace. Today, it’s any business making metal parts. That creates a cycle in which technical progress and scale keep ramping up, while costs keep spiraling down. Professor Beuth and his researchers at Carnegie Mellon’s NextManufacturing Center believe we’re just beginning to see the benefits of 3D printing. They are currently experimenting with techniques to control the properties of metal at the molecular level. Image courtesy of CMU Engineering. In the end, says O’Hara, 3D printing isn’t going to completely replace traditional manufacturing methods. It will complement them. “We’re going to be another tool that can be used to make aircraft parts,” he says. Better, cheaper, faster. As a pilot with a very expensive passion for flying, that all sounds good to me. And, hey, even though I know it’s a daydream, if you happen to have CAD drawings for a Pilatus, maybe we could just try to print a few? Learn more at Carnegie Mellon University's NextManufacturing Center, Sciaky, and GE Aviation. Also, for a more general overview of the development and use of 3D printing technology, check out some of CMU's additive manufacturing videos below.